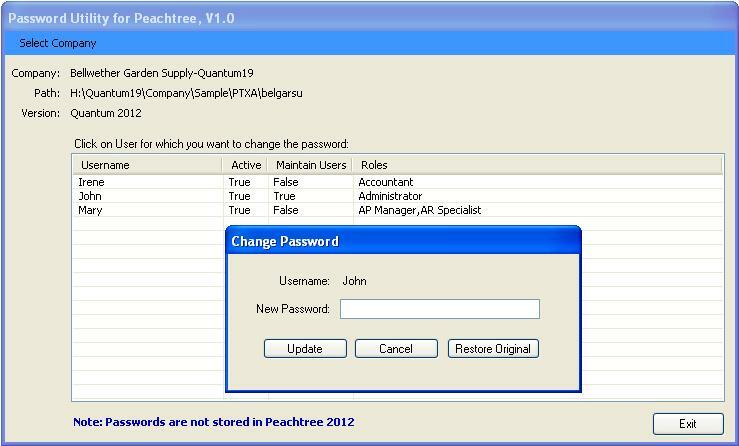 A simple utility that lets you log into Peachtree 2008 through 2019 databases, including Quantum, when you don't know the user passwords. Peachtree removed passwords from their database in 2012, so the utility works differently for 2012 and later databases: For pre-2012 databases the actual user passwords are displayed. For 2012 and later databases the utility lets you change the password of any user to a valid password of your choice and optionally to restore the original password afterwards.